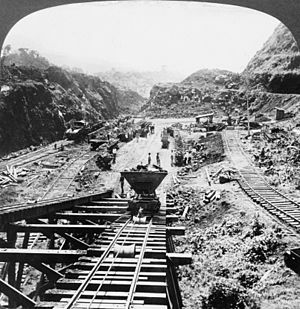 Back in 1902, as the French were grinding down in their ill-fated Panama canal effort, powerful business forces here in the US were pushing our government to blast our own shipping shortcut– through Nicaragua. The French were anxious to cut their losses in Panama after years of struggle and tragedy far from home. They hoped to entice the adventurous US President Theodore Roosevelt into taking the disastrous headache off their hands. Their lobbyist, an agent of the French Panama Canal Company in Washington, was named Philippe Banua-Varilla. The initial price tag for the whole Panama bundle was reportedly $40 million. Unfortunately for the Panama crowd the US Congress was leaning strongly toward the Nicaraguan plan, in fact the House voted in favor of building the canal in Nicaragua. It seemed a virtual shoe-in that the Senate would follow suite. The French reduced the price out of desperation but prospects for success appeared dim. Then, as fate would have it, a volcano exploded on the island of St Martinique killing 30,000 people! Immediately the question of volcanoes in the Nicaraguan canal zone surfaced in Washington but the Nicaraguans sternly denied the presence of any active volcanoes. Legend has it that Banua-Varilla was about to leave town empty-handed when at the last minute a colleague showed him a recent Nicaraguan postage stamp. Amazingly, in an episode of unbelievably bad timing for the Nicaraguans, the stamp displayed a picture of the Momotombo volcano spewing lava and smoke. Seizing the moment, on the eve of the vote in the US Senate, the French lobbyist reportedly scoured the various Washington DC area stamp sellers somehow acquiring enough copies to send one to each undecided senator. Accompanying the stamp was a note suggesting that the evidence proved that Nicaragua was no stranger to violent geological events and the Nicaraguans knew it. In an amazing Hail-Mary turn of events, even though the suspect volcano was 150km from the proposed canal, the stamp ploy was successful. The Senate voted for Panama– the Nicaraguan canal deal was dead. Just like that! The hand-writing was on the wall for Zelaya – in October 1909 an American proxy, General Juan Jose Estrada, declared himself president igniting revolution in the country. Taft ordered troops to next-door Panama to further intimidate the besieged Zelaya. Within two months he was forced to resign. Estrada later marched unopposed into Managua. The New York Times printed this when Estrada was sworn in: “On that day began the American rule of Nicaragua, political and economic.” The Fletcher Brothers continued to run the La Luz y Los Angeles mines for decades to follow. The stamp episode and aftermath was a turning point in Nicaraguan history; it was the first confrontation in what has turned out to be a century of strained relations between Nicaragua and the US. Those tensions continue to this day. Nicaragua’s failed dreams of a canal linking its Atlantic and Pacific coasts turned out to be costly. Panama’s rewards for success appear to be considerable. Today, about 15,000 ships use the Panama canal each year, carrying 200m tons of cargo, earning the country about $800m annually.